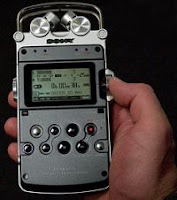 Transom’s equipment Jeff Towne has posted an excellent review of the Sony PCM-D50 digital audio recorder, complete with a ton of audio clips that should give you a pretty good idea of what the recorder sounds like using internal mics and a variety of external mics. If you’re using the internal mics, you will hear a click when you hit the track divide button, and no matter what microphone you’re using there will be a slight disconnect between the before and after track, but you’d have to listen really closely to notice it. I agree. But I wouldn’t count any of these issues as big problems. It’s hard to find a sturdier, easier to use recorder for under $500 that sounds as good at the PCM-D50. The Marantz PMD620 and Olympus LS-10 do have many of the same features at slightly lower prices, but each has its own set of minor flaws.